What to do with your kids? It’s the theme of every spring break travel story. We all love our kids, but let’s face it, they cramp our style sometimes. So how about spring break for parents? Have we not earned a little indulgence? From the poolside hammocks at the Scandinave Spa in Whistler, yes. From the tranquil cross-country ski trails of Callaghan Valley, certainly. From the excitement found atop a throbbing 4-stroke Bombardier snowmobile, hell yeah! The best part of a trip can be in the planning, but sometimes it’s easier to leave it to experts. Enjoy Whistler offers personalized service to ensure travellers strapped for time can still enjoy a memorable visit, with or without children. In 72 hours, I drove fast, fired rifles, relaxed in a spa and skied till I dropped. I think I may have even had a better time than my kids. Some of it was hard work though. Take the Biathlon Experience, for example, a two-hour immersion into the oldest winter sport of them all. 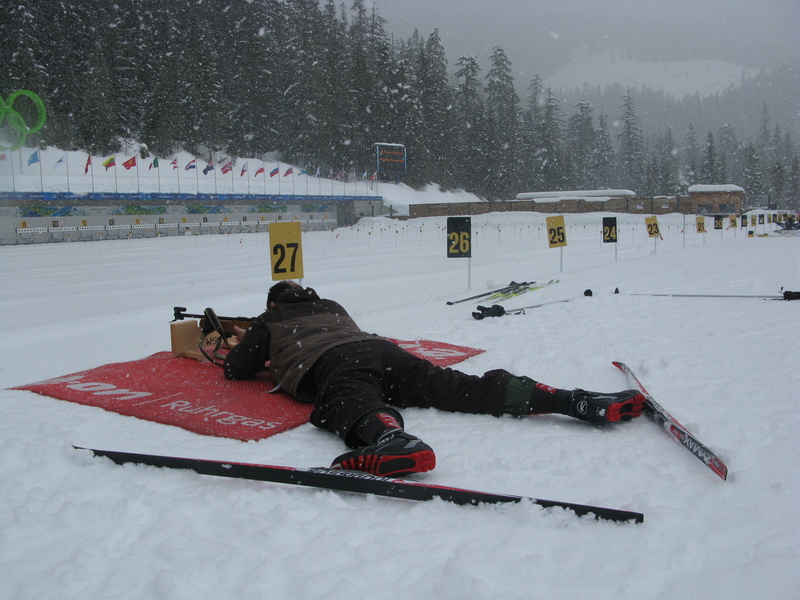 At the Whistler Olympic Park in Callaghan Valley, adults can try the sport, a combination of cross-country skiing and rifle marksmanship. Aside from one regrettable hunting trip in Ireland 20 years ago (the rabbit got away), I’ve never done either. That was soon apparent to my instructor Antoine, who gently coached me through the finer points of skate skiing. In contrast to classic cross-country skis, skate skis are thinner, trickier, and faster. “Tougher to learn, but easier to master,” said Antoine, who should know. He started 30 years ago, when he was 22 months old. After some advice on balancing and edging, I began shifting my weight from side to side, achieving a clumsy version of V-skating – no poles, just pushing off with one ski and repeating with the other. We moved on to the classic diagonal stride, coordinating a forward poling arm with the opposite driving leg. Antoine made it look like ballet, all grace and elegance. I looked like Bambi with haemorrhoids. Ignore the snow, gusty winds, racing heartbeat and the burrito you ate for lunch, and just focus on the grapefruit-size target 50 metres away. I was exhausted by the time we reached the Biathlon Range, where I at least got to lie down. It was the part I’d been waiting for: Firing a 22-calibre rifle. Antoine demonstrated, telling me to focus on my breathing, and pointing out that with snow and gusty winds, a racing heartbeat won’t improve my chances of hitting a grapefruit-size target, 50 metres away. I hit five out of five. Would the Whistler Olympic Park really go to such lengths to make me feel good? “The size of grapefruits, you say?” my wife whispered to me later that evening through the mist of a eucalyptus steam bath at Whistler’s Scandinave Spa. It wasn’t a whisper of hushed reverence; in fact I detected a hint of sarcasm. Talking among guests is strongly discouraged at Scandinave, which offers hydrotherapy and massage packages. The hydrotherapy comprises outdoor baths – some hot, some cold – with a sauna, steam room and solarium. We followed the hot-cold relaxation sequence three or four times, and aside from the occasional gasp in the Nordic plunge pools, we observed the spa’s code of silence. There was plenty of time to talk, back at the Fairmont Chateau Whistler. Our kids were making the most of the hotel’s pools and hot tubs, where silence is discouraged. The hotel is more progressive than most when it comes to children. Not only do its chefs offer a children’s menu that is actually healthy (and delicious), its gym offers guided fitness training for seven to 17-year-olds. "Yeah, it's Ryan ... wait a second, my dad's taking a picture." 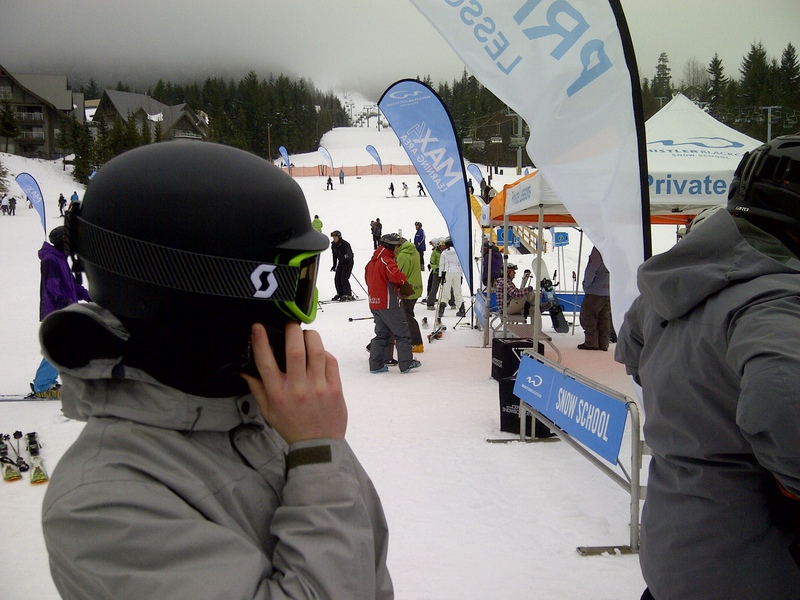 On Blackcomb the next day, my son Ryan explained to me Whistler Blackcomb Live, the new Telus Mobile app. Track your runs using GPS, clock distances travelled, vertical shredded and maximum speeds. As if further proof were needed that Ryan’s cool and I’m not, the app is available on his iPhone, but not on my Blackberry. I was stressed to learn that the app logged Ryan’s fastest speed at almost 80 km/h. But then I’m a 44-year-old dad who skis: As long as Ryan’s mum doesn’t find out, he’ll be fine. Not that any of us were slowing down the following day. 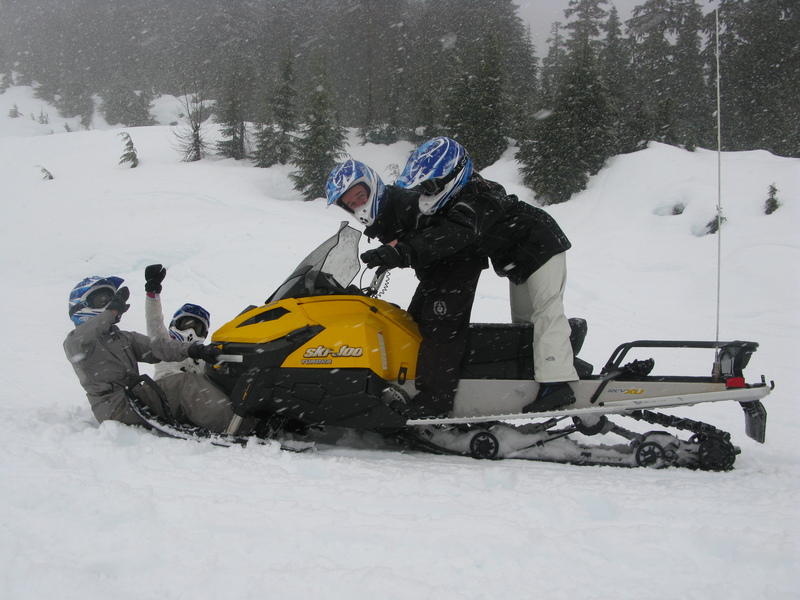 The biggest adrenaline rush of the weekend came courtesy of Canadian Snowmobile Adventures’ Callaghan Cruiser tour. After getting geared up in helmets, gloves and heavy waterproof jackets, our guide Morgan gave us a detailed safety talk about the Bombardier snowmobiles and the conditions ahead. The engine sparked to life, and I was actually a little nervous until Ryan leaned into my ear and told me to step on it. The Callaghan Cruiser tour may be billed as ‘family friendly’, but I still felt just slightly rebellious whizzing around wide and winding trails in a blizzard. We followed our guide Morgan to a frozen lake near Northair, a former gold mine, where we could really let loose on the wide-open flat. The snow fell as thick as the traffic we encountered on the drive back to Horseshoe Bay. The backcountry snowmobile route might have been quicker. Not to mention more fun!